Nutrients in the bulb work directly on the heart, inhibiting the calcification of coronary arteries. The mechanics of this treatment differ entirely from synthetic prescription medicine which only alleviates the symptoms by moderating them. Scientists conclude that garlic can prove to be essential in root-cause resolution medicine, wherein diseases are treated at their fundamental pathology rather than just suppressing symptoms. It is no secret that garlic contains a variety of health benefits. Numerous studies have shown garlic’s power to enhance bone health, protect against organ damage from heavy metals, and even prevent Alzheimer’s disease and dementia. In terms of cardiac health, most studies reviewed the effects of aged garlic extract in the prevention of coronary artery calcification. This new study is the first to study the effects of garlic on noncalcified plaque. Fifty-five patients, with an average age of 58.7 and all of whom had a metabolic condition, participated in the study. Participants were divided into two groups, with one group receiving 2,400 mg of aged garlic daily and the other getting a placebo. Over the course of the year, the participants were regularly checked for cardiac health. Patients maintained their current medication like aspirin or hypertension pills. The group that took aged garlic showed a significant decrease in plaque volume compared with the placebo group who — surprisingly — showed an increase in plaque volume. Plaque volume is a major factor in inhibited blood supply which can lead to a heart attack. Garlic addresses several health concerns all at once. The blend of healing properties address all associated causes of atherosclerosis. Scientists have highlighted these heart-saving properties. First, garlic lowers LDL cholesterol levels. Studies show that garlic supplementation can reduce LDL levels by as much as 10 to 15 percent. However, garlic does not appear to affect triglyceride levels, which are another risk factor for heart disease. 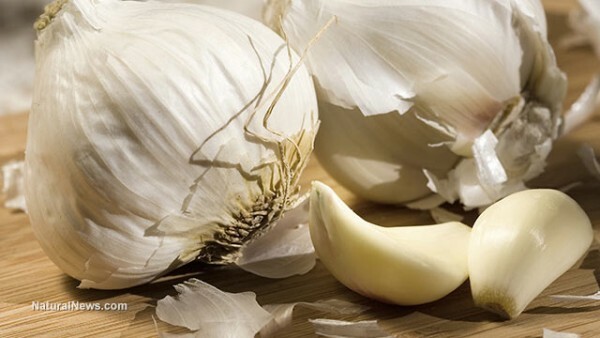 Second, garlic reduces blood pressure levels. Those who constantly complain about high blood pressure are encouraged to up their intake of garlic supplements. In fact, one study points that doses of 600 to 1,500 mg of aged garlic extract taken over a 24-week period proved to be just as effective as the drug Atenolol — a commonly prescribed drug — in reducing blood pressure. Third, garlic has anti-inflammatory properties which impact the flexibility of the blood vessels. Chronic inflammation of the coronary arteries can lead to damage and heart disease. Lastly, garlic is an antioxidant. By reducing free radical damage, garlic strengthens the immune system and makes it easier to fight off the negative effects of daily stresses and poor lifestyle choices. It is crucial that proper lifestyle habits and diet be practiced to prevent heart disease. The Centers for Disease Control and Prevention (CDC) report that 610,000 people of heart disease annually. This translates to one in every four deaths in America. Having a heart attack is listed as the leading cause of death for both men and women.